Interested in a new SUV for you and your family? Consider the new Ford Explorer. This SUV seats up to seven passengers and offers plenty of features and available driver-assist technologies! What’s more, the Explorer interior is versatile, with available third-row PowerFold® seating. Browse our Ford Explorer models online, then visit Glenwood Springs Ford near Denver and Montrose to test drive an Explorer today! Why Buy a New For Explorer at Glenwood Springs Ford? 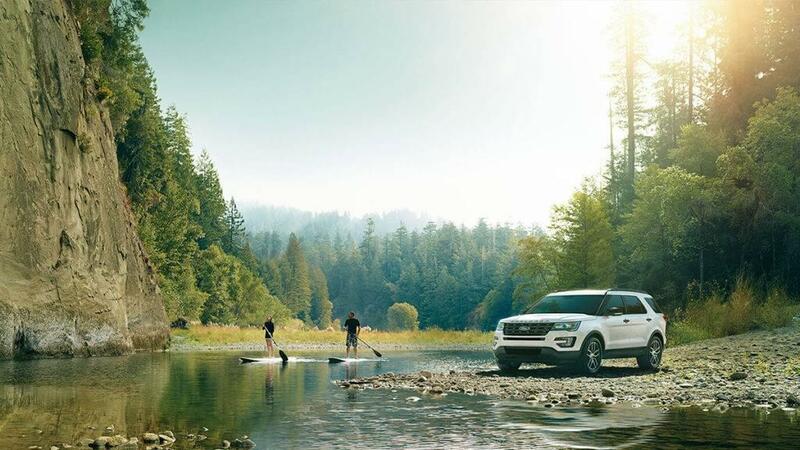 Contact us with questions about the benefits and perks offered at our dealership, then visit us in Glenwood Springs to test drive a Ford Explorer today! Whether you are navigating tough terrain or it’s your turn in the carpool, you will enjoy a stress-free commute thanks to the many amenities on latest Ford Explorer. This available responsive, voice-activated feature is user-friendly and can help you control the climate of the vehicle, play your favorite tunes, and so much more. Included with the available Intelligent 4WD System, the Terrain Management System™ allows you to adjust the vehicle’s settings depending on the terrain you encounter. Cold mornings are no problem with the Explorer Platinum trim, thanks to its heated second-row bucket seats. With 5,000 lbs. of available towing capacity, the Explorer is ready to haul all of your gear. Are you ready to experience just how capable this family-friendly vehicle is? Compare the Explorer to the Subaru Outback, then stop by Glenwood Springs Ford to further explore the Ford Explorer today.